Tips from a mom with Asperger's Syndrome. How to love and understand Autistic children better. Sometimes I don't know if I want to tell the world that I have a mild form of Autism. I think it scares people. I am afraid that people will make assumptions, judge me, and stay away from me because they don't know what to expect from me. After 37 years of coping with Asperger's Syndrome, I feel like I've mastered the art of "pretending to be normal" so I can fit in, be accepted and not scare people. Most people are suprised to hear that I have Asperger's Syndrome, because I really have learned to adjust to the challenges and demands of the world around me. ...the power and understanding that allows me to understand, relate to and love children with labels. I can see into the heart and mind of children with Autism, Asperger's, Dyslexia, ADHD and other unique challenges. In fact, I understand the needs of children of all ages, stages and levels of ability uniquely well, because I still think like a child. I am creative, I am brave, I am timid, I'm afraid, I'm adventurous, I'm careful, I'm carefree, I'm naive, I'm insightful, I'm sensitive, I'm honest, I'm willing to try anything ONCE if I am holding the hand of someone I trust. I am able to understand what hurts a child who is sensitive to lights, sounds, colors, noises, and uncertainty. I know how to help parents to see life from the perspective of a child with Autism, or Dyslexia, or ADHD. Today I want to help you to understand and love your Autistic child better, here are a few things I have learned, from my own experience and from working with children on the spectrum. 1. Make sure that your child has free time to play, learn, draw, invent, or take things apart. 2. Their hobbies and special interests bring them a lot of joy. Watch and listen when they share their interests with you- this is how they let you into their world. 3. Let them be part of the planning process when deciding where to go and what to do. When children with autism are always told what to do they feel out of control. When you make plans for your child it is very helpful to use visual reminders. Be sure to tape up some charts, posters, calenders and schedules where your child can see them often. My daughter with Asperger's loves charts, and she loves to make chore charts for everyone. Just be sure to actually follow through with the plans on the charts. 5. Allow your child to have a pet of his own. children with Autism have a special connection with animals. 6. Nutrition matters! I know that I feel my best when I have a low sugar diet, have lots of whole foods, stay away from artificial ingredients and colors, eat yogurt, and take my fish oil and vitamin C supplements. I can think more clearly and control my mood so much better when I am getting the nutrition I need. 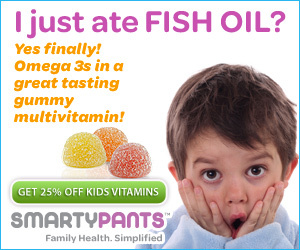 If your child is getting too many sweets and not enough omega 3s (found in fish oil) try making some simple changes! 7. Invest in your child's hobbies. Focus on your child's gifts and talents- not on his or her weaknesses. Treasure who your child is. 8. Be sensitive to the environment. Children with Autism hear, see, feel and sense things that others can't even begin to comprehend. Make sure your child has a quiet place to escape to whenever possible. 9. Know what your child's favorite colors are, if you use their favorite colors around the house it will have a calming effect. 10. If your child begins to get upset, overwhelmed or starts to melt down- do not belittle the problem that is causing the meltdown. Try to help your child feel safe and secure by meeting his needs. If you can't fix or change the situation try to talk to him about his special interests and hobbies. When an autistic child is thinking about his hobbies he engages a different part of his mind and will often stop focusing on whatever is upsetting him. 11. You may think your child is upset for no reason- there is always a reason- Children with Autism are very sensitive (this can be a gift) try to keep your child in a gentle and pleasing environment when possible. Make your home a pleasant place. Blue walls - blue walls make me feel sick. The feeling of Plastic furniture - yuck. The hum of a TV or a Dishwasher- like fingernails on the chalk board! Sitting in the center of a large room - makes me feel like I'm on a boat. A condescending tone of voice- causes a burning feeling or pressure in my head. An unexpected change in plans- I get the feeling that I had just put together a puzzle and someone came along and messed it all up. Bright overhead lighting - I feel like someone is shining a flash light in my eyes. 12. Help your child by saying "No" to things that cause your child to form addictions and waste time. If your child plays videos games be very careful not to depend on this as the #1 form of entertainment. 13. Slow down, don't be so busy- enjoy life with your child. Take time for art, hobbies, board games, cards, nature and outdoor play (kids with Autism love media- but it's not very good for them). 14. If your child shows interest in forming a hobby are starting a collection- invest in that hobby! 15. Avoid putting your child in situations that cause meltdowns, find alternatives. When you are taking your child to an environment that is new, or overwhelming help him to understand what to expect. 16. Reward your child with prizes. I can get through a very tough situation if I know I am going to have ice-cream when it's all over. Ice-cream makes everything better. 17. Have faith. Your child is part of your family for a reason. You have what it takes to be an excellent parent, and no one loves your child like you do. Believe in your child's gifts and talents. Believe that your child is a gift from God who is going to have a very special impact on the world. Please comment below if this article was helpful! Thank you for sharing this, I have two boys on the spectrum who are very similar but very different at the same time. These tips were very helpful, because just when you think you have it figured out ... you don't. LOVE this. Thank you. Sometimes, when the outside world (school) tries to make your child act neurotypical (impossible... but... ) you can start to think what you do as a parent in somehow wrong. It is so reassuring as a parent of a child with Aspergers to hear such things from an adult... so we can defend the kidspeak we have come to understand so well. WOW! Written like a professional! Thank you for these helpful insights. My Sam is 5 and he is Aspberger's. GOD bless you. Very nice article, Miss Sarah. As a parent and advocate for those with autism, could I add one more thing? Visual aids can make all the difference for those with autism. Calendars, schedules (either written or pictures or both), small pics on dresser drawers, etc. can really help someone who has these autism issues! Hi Lauren my sun was diagnosed offer three months ago and I duly understand the urgency to get him to understand everything is ok and is on time but I am strugling to setup a time chart for him to get to do are there any way you can maybe give me an egsample of the time chart you are using it will help me tremendously! Oh it is nice to know I am doing some things right! I am aspie too, but undiagnosed. It makes dealing with the tough stuff I have to for her sake even harder, but I have gotten better because of it as well. Now, I also have some things I can work on to improve things for both her and I. Thanks!! Great job! Should be very helpful to parents. I would just add that directly asking your child what he/she likes/wants/needs or, if they aren't verbal, studying them to figure it out, is very important. We parents almost never get it exactly right unless we ask, and letting them explain it helps them to explain it to others in the future (self-advocating in the grown-up world). I love your list of things you find upsetting - I don't like polka dots, they make my head itch! Thank you soooo much. I can relate to what you talk about. My son has aspergers. I think it is great you are sharing your knowlege with people. My son isn't able to tell me in words what is going on for him. Thank you...I have a child with Aspergers and truly have lived your "list" with him. I value my child and now have to teach others what a special child he is as well. Love, education, time, and understanding are the keys. I watched you all on house hunters! I had to google to see if your family was still in Italy. Reading what you have written about Aspergers is so right on! I believe I have Aspergers and my kids too. We found Gaps diet and that has really helped:). I can't wait to start following your blog! There was an article about all of you in the OC Register and it mentioned you were from Newport Beach. What high school did you go to and what was your maiden name? Can you add vacuum cleaners to the list of irritating sounds? The high pitch sound drives me crazy. A full vacuum bag makes it worse. Loud commercials on TV, too. Hey, even the non Asperger population doesn't like loud commercials either.